Micro fiber is a special yarn that is 0.1 denier, an ultra fine Micro fiber. This filament is very fine, strong and is virtually lint-free. The wedge-shaped polyester, together with the core nylon, fits the surface of any object and gathers dust efficiently. This ultra fine Kaywos Cloth does not damage any surface. The fibers grab and hold dirt, dust and grime. This is the magnet effect. Made from 70% Polyester, 30% Polyamide (nylon) Single fiber is approximately 1/20th the diameter of a strand of silk. Disperses oil, grease, dirt, grime, film, dust. Tough on dirt and gentle on surface. Kaywos Cloth holds 7 times its weight in dirt, grime and liquid. Each fiber is 200 times finer than a human hair! (this is the secret of micro fiber’s incredible cleaning ability). Open spaces between fibers hold dust, dirt, and oil until washed away with mild soap or detergent. Spaces also allow large amounts of moisture to be collected into the cloths making them very absorbent. These same spaces allow for quicker drying time eliminating much of the bacterial growth found in slow drying cloths. Millions of tiny ‘scoops’ pull dirt and dust up inside the cloth where they remain until washed away. Results are clean, streak free surfaces. Using water helps emulsify dirt & oil making it easier for the micro fiber cloth to pick it up. Its high absorbency will quickly clean up spills. Tends to push dirt and dust. Residue is left behind on the surface area you’re cleaning. Lack of interior open spaces, makes ordinary cloth hold very little dirt. Machine wash with laundry detergent or hand wash with dish soap in hot water. Rinse thoroughly. Using bleach will shorten the life of your micro fiber cloths. Do not use fabric softener (fabric softener leaves a film on the cloth and decreases its effectiveness). Be careful when machine washing or drying in mixed loads as micro fiber cloths will pick up lint from other fabrics. Air-dry or put in dryer on low to medium heat. 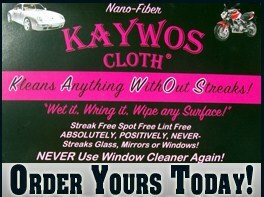 2 Kaywos cloths - CLEANS WITHOUT SOAP ! !